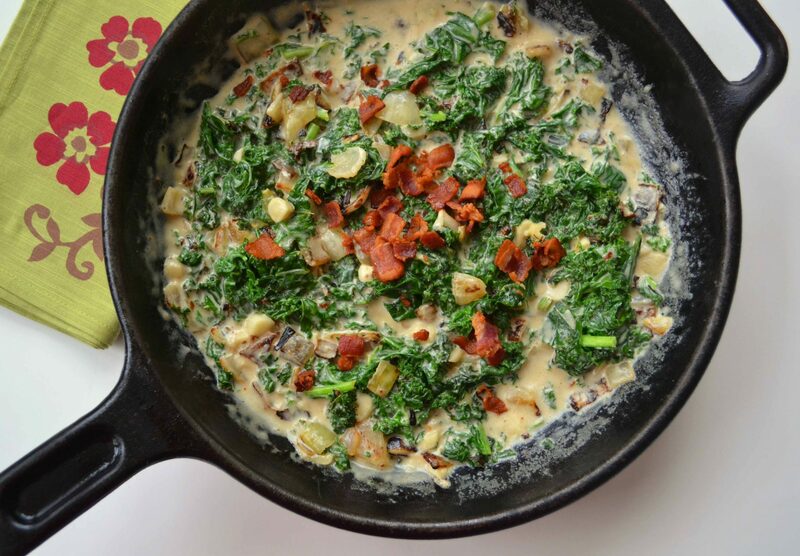 inspired by this one here - which with its browned butter sounds fantastic too - but I needed to streamline it a little bit, and given the opportunity couldn't not make bacon béchamel to go atop winter greens..
1In a large, heavy skillet, cook the bacon until crisp; remove with a slotted spoon and set aside. Whisk the flour into the bacon drippings. Whisk in the milk and if you like, the shallot, bay leaf and peppercorns. Bring to a boil, whisking often. Let simmer for a few minutes and then pour it into a bowl to set aside. If you added the flavour bits, you'll need to pour it through a sieve to get rid of them. Wipe out the pan. 2Roughly chop the greens, ditching the tough ribs. 3Heat a drizzle of oil and/or butter in the pan and sauté the onion for 5 minutes, until soft and starting to turn golden. Add the kale (or other greens) and cook until it starts to wilt; add the garlic, béchamel, cream and chili flakes and stir to coat; cover and cook for 5-7 minutes, until the greens are tender. Season with salt and pepper and serve with the bacon scattered on top.